Following my trip to Thailand, I came back not only bloated on noodles and rice, but with refreshed design visions and inspirations, triggered by my everyday surroundings while in SE Asia. I found inspirations in the vibrant life and culture of Thailand, from the silver-etched cups they drink out of, to the eye popping colors present in food markets, orchids, and lush jungle surroundings. The patterns, textures, and natural tropical elements of the country deeply spoke to me, and have molded my personal style in fresh new ways. I now love incorporating the stylistic elements of such a vibrant country into my interior design aesthetics. Here, I’ve put together my go to list for an instant tropical-bohemian feel. I decided to take some of my favorite flavors and marry them into the goodness of a bowl…pina coladas, coconut shrimp, avocado, and ginger. The result was a beautiful bowl delight which I’m calling a Pina Colada Shrimp Bowl. I hand breaded and baked my own coconut shrimp for a healthy version of the deep-fried, crunchy island classic. I then built a bowl with my favorite salad ingredients, and I tied in a ginger-based dressing for an Asian kick. Coconut shrimp paired with citrus is a no-brainer, so I threw together a quick pineapple basil salsa. The final product was a tropical infusion of Island-Asian flavors. I also added some peanuts last minute to bring in some crunch, but next time I would opt for Macadamia Nuts instead. Though I didn’t follow a recipe, I’ll list the ingredients below, along with approximate amounts and steps. 1. Preheat oven to 400 degrees F. 2. Line a baking sheet with non-stick foil, or spray a sheet with olive oil 3. Put the crackers in a sealed ziploc bag and crush them (with a rolling pin or meat-pounder or some other heavy object) until they resemble finely ground bread crumbs. 4. Set up your breading station: place the flour in a bowl; whisk the eggs and put them in a separate bowl; and mix the coconut and bread crumbs and put them in a bowl. 5. Sprinkle the deveined and butterflied shrimp with salt and pepper. 6. Working in batches, first dip the cleaned shrimp in the flour, and shake off excess; second dip the floured shrimp into the egg mix; lastly dip the shrimp into the coconut-crumb mixture, making sure to press the coconut onto the shrimp so it sticks in place. 7. Transfer breaded shrimp to the baking sheet; Bake for about 15 minutes,until coconut begins to lightly brown. Mix all ingredients in a bowl together. Add more lime juice if desired. This is an approximation, so if it tastes too much like vinegar or lime juice, then add more water and honey. If it tastes too much like ginger dressing, then add more of the other ingredients until you reach a good balance. Arrange all of the ingredients in a bowl, except for the nuts and sesame seeds. Drizzle the salad mix with the dressing until evenly coated. Next add the pineapple salsa, the coconut shrimp, the nuts and the sesame seeds and enjoy. NOTE: this will make a large batch of coconut shrimp. I ate them as leftovers with a BBQ-jerk dipping sauce. They would also go well as a snack alongside a mango chutney. I’ll officially be drooling my way into spring. 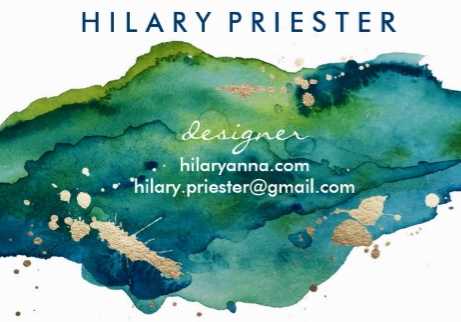 Anthropologie‘s new house & home collection dropped recently, with over 1000s of new arrivals for the vintage-chic-boho-interior-design obsessed girl like myself. There is also a sassy spring home lookbook to go along with it, providing beautiful photo inspirations on how to incorporate their new decor pieces into your interior look. I’m loving the more modern-esque lines used in some of their new furniture pieces, offset of course with vintage details, lush velvet fabrics, and vibrant chic patterns and textures characteristic to the Anthro brand. I’ve sourced a few of my favorite pieces, although everything in the collection is seriously to die for. (Check it out for yourself here) . Lemongrass. Kaffir lime leaves. Galangal Root. Banana leaves. Tamarind. Rambutans. Durian Fruit. Dried shrimp paste (warning: stay away from this one at all costs). These are some of the new ingredients that I uncovered on my most recent adventure/culinary journey across Thailand (read about it here!). If you know me, you know that a post based solely on the food from our trip was obviously in order. I’m a Thai food junkie, so for me, the chance to visit the motherland and uncover rainbows of curries, pan fried noodles adorned with peanuts, and rices laced with pineapple chunks was truly an awe-inspiring experience. Before venturing to Southeast Asia, I was slightly nervous about the food. I’m familiar with the Western versions of Thai food..but I wasn’t entirely sure what to expect. My worry stemmed from the Anthony Bourdain in Thailand episode, where he went cross-country to hunt down a bowl of a Thai speciality, Cow’s Blood Soup. This, paired alongside my ideology that people casually hang around enjoying grilled scorpions on a stick, or deep fried maggots and cockroaches–left me with an anxious feeling. Half way through our first meal in Thailand, I knew I had entered a full-fledged food Heaven. Everything is so vibrant, flavorful, and rich. Everything also comes served in hollowed out pineapple shells, or adorned with 10 orchids. Eating our way across Thailand was an experience I’ll cherish forever, and it advanced my food knowledge and shocked my taste buds in amazing ways. So, I’ve decided to highlight some of the Thai ingredients and flavors we uncovered (what to try and what to stay the hell away from), along with some of my favorite meals. (Just in case anyone reading this feels like venturing to their local Asian market and getting weird, or hopping on a plane and soaking up the Thai flavors first-hand). green papaya salad (top)-one of the most popular salads of Thailand and a must try. A combo of raw shredded green papaya, carrots, and roasted peanuts/tomato/long beans in a tangy vinaigrette. Kind of like the Thai version of slaw>>>NOTE: The vinaigrette in this salad contains fish sauce, a widely used condiment across SE Asia. Made from fermented anchovies, fish sauce is used in a lot of Thai food, and for the most part it blends in. However, some dishes (often salads) go heavy on it in the dressings, and it is a serious mouthful. When used heavily, it tastes and smells like a straight up fishy-vinegar combo. Watch out for generous amounts of it, seriously. Additionally, a thing called Shrimp Paste exists in these parts of the world. Exactly as it sounds: shrimp, pulverized into a grey-ish goopy looking paste. I’m not very familiar with this item, and I would like to keep it that way. I do know, however, that I made the mistake of ordering a dish one time that highlighted this ingredient, called “stir fried chicken with shrimp paste.” I was trying to be adventurous, and it completely backfired. Do yourself a favor, and stay away from any food that directly identifies shrimp paste in the title at all costs. Rambutans (top): a funky looking spike-y fruit. You have to pry it open and on the inside is a soft, sweet ball of fruit. Similar to the texture of a melon. They snack on these little fruit balls and in some bars they use them to chase tequila, in lieu of lime and salt. Pad-See-U (top left): a pan fried noodle dish (similar to the national dish of Thailand that everyone knows, Pad Thai). 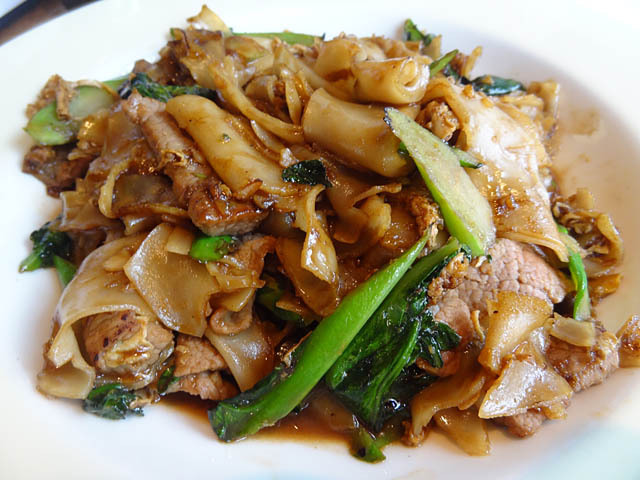 Pad-see-u is made with a thicker, brown soy-based sauce, is more vegetable heavy, and uses wide rice noodles vs. the thin noodles in Pad Thai. Both are delicious but Pad-See-U is a bit more hearty (perhaps a better choice for a 2 am intoxicated snack). Hot banana in coconut milk (bottom left): BEST DESSERT IN THAILAND…this is so simple and exactly as the name implies. 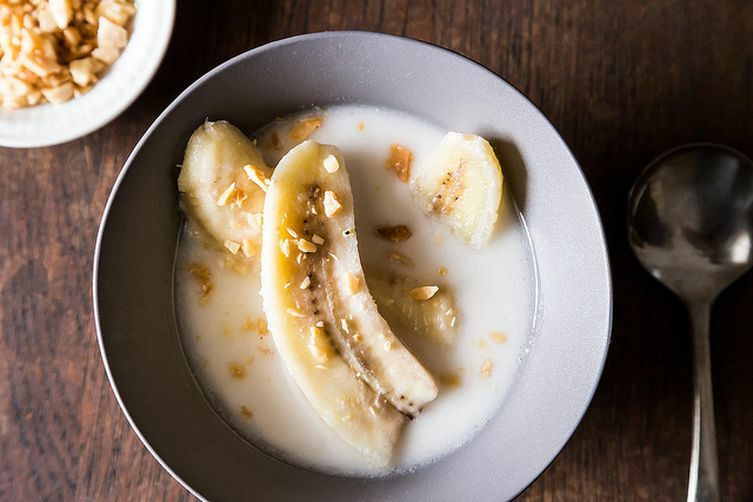 Its a hot coconut milk base, sweetened with sugar, and served with warm, cooked bananas. Sometimes they add cinnamon. So comforting and delicious, even on the hottest of days. Must must must have. Also, Mango Sticky Rice (pictured further down) is the other most popular Thai dessert dish. The idea of rice sounds weird for a sweet treat..but it is so soft and sticky, almost pudding like, and its doused in a hot sweet milk concoction. Served alongside perfectly ripe juicy mangos, this dish somehow works and is so delicious. Summer Sass Bowl: Grilled chicken & zuchinni, pomegranate seeds, chopped almonds, and avocado atop a bed of mint and basil quinoa, all drizzled with a light honey mustard lemon vinaigrette . Kung Pao Bowl: Chinese chili and garlic stir fried chicken & veggies, a soy glaze, brown rice, peanuts, fresh basil, and avocado. Cinco De Mayo Bowl: Garlic-lime dressed kale, roasted corn, cumin rubbed roasted vegetables, salsa & guac, shredded monterrey jack, chicken.